The majority of flowers purchased for a wedding are required for bridal table arrangements at the reception site. If each table is to have an arrangement, as well as some extra flowers decorating the room, then it pays for a bride to consider these table arrangements from every angle. Factors pertaining to bridal table arrangements, options for bridal table arrangements, non-floral options for bridal table arrangements and site provided bridal table arrangements are all things that should be considered when selecting flowers for the reception site. Before table arrangements are chosen there are many factors to consider. Budget, wedding colour scheme, reception site colour scheme, scent of potential flowers, how an arrangement will look in pictures, if guests will be able to see each other over the arrangement, if guests will be able to see the head table (if there is one) over the arrangement and if there is a plan for where all of the flowers will go following the reception, are all factors that should influence the selection of bridal table arrangements. There are many floral options for bridal table arrangements from simple bouquets to sculpture-like creations. When a bride is selecting her flowers she might consider bringing pages from bridal magazines with her to the florist so that everyone is on the same page about the end product. Usually bridal table bouquets will follow the wedding colour scheme unless they clash too horribly with the reception site. 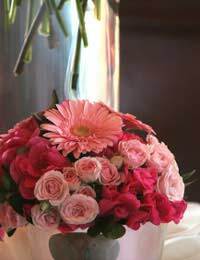 Brides may also opt to use their own bouquet and the bouquets of the bridesmaids in bridal table arrangements. Sometimes budget, personal preference or even allergies mean that flowers can not be used as centrepieces at a reception. In this case, brides may opt for silk flowers, fresh foliage, fruit displays, candles, pebbles, seashells, lanterns and much more. If brides are having a theme wedding, such as “books,” “music” or a particular country or culture that bride the couple together then items pertaining to the themes can also be used. Some sites provide their own floral decorations, which can be great for the budget but can be a nightmare for brides with their own visions of the bridal table arrangements. Before agreeing to site provided arrangements brides should ask to see an example of the arrangements as well as to view their reception room when all of the tables have these arrangements displayed. Brides will also want to ask about if the arrangements are fresh or silk, when the arrangements will be made and how they will be stored (if they are fresh), if there are any options for the colours and flowers used in the displays and if there would be any sort of special charge if they did decide to bring in their own flowers. Bridal table arrangements are often the majority of flowers purchased for a wedding. To be sure that she gets exactly what she wants, brides should consider all of the factors pertaining to bridal table arrangements, options for bridal table arrangements, non-floral options for bridal table arrangements and any site provided bridal table arrangements.